Whenever we visit a new plane, the creative team does reams and reams of work building a world that is unique, but at the same time familiar in key ways. Lorwyn was a fantasy world with elves, goblins, and faeries, but each with its own Lorwyn twist. Innistrad played on the tropes of Gothic horror, but had its own spin on zombies, vampires, and ghosts. Likewise, Khans of Tarkir has its own touches when it comes to transporting classic Magic and fantasy creatures into a new world. One particular Tarkir touch was the way Goblins were depicted. They still feel like goblins, but they certainly look different. 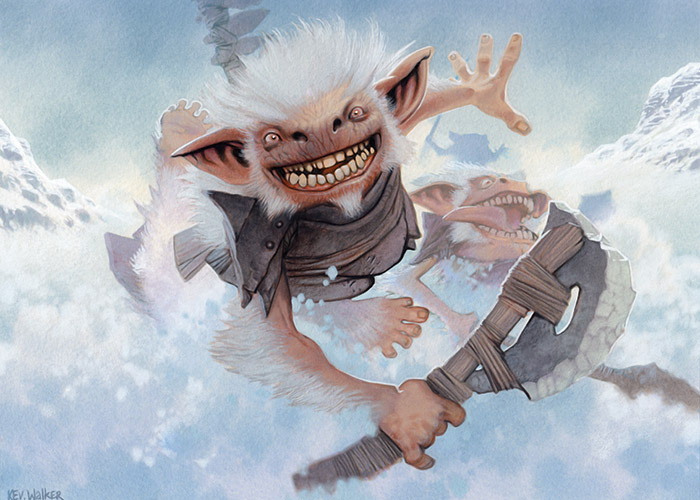 Action: Show 2 or more Temur goblins tumbling—literally head over heels—down the snow of a mountainside. They whoop and holler as they crash their way down the snow, weapons flailing, kicking up a minor avalanche as they tumble and screech. This is how they charge down the mountain into battle. Mood: Chaos is on its way, and it's traveling at great speed. 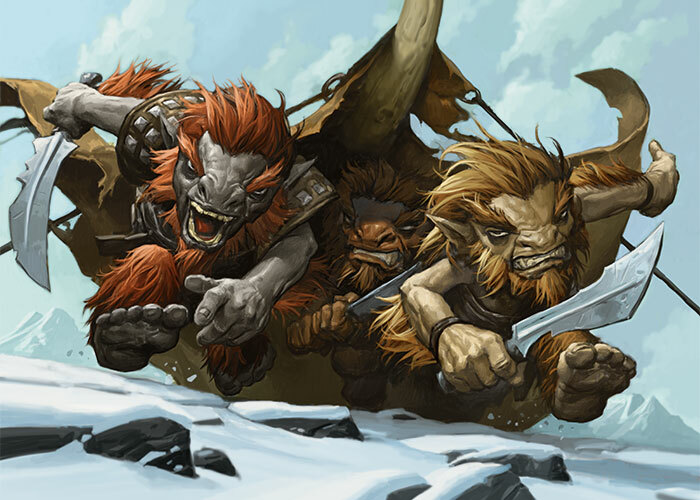 Action: Show three Mardu-style goblins (with a variety of fur colors). They have popped up out of a hide-covered tent or yurt. They come out armed to the teeth, viciously brandishing their weapons, ready to fight. Mood: What they lack in size, they make up for in viciousness. 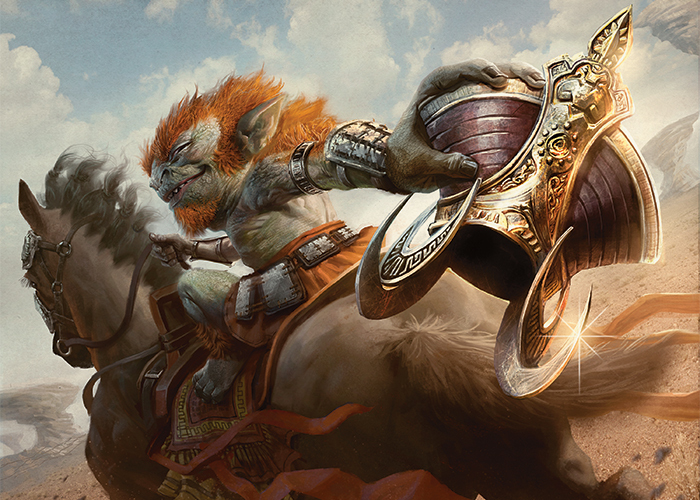 Action: Show a goblin raider of the Mardu clan. He's squatting on the saddle of a horse with a sly, impish look on his face. He has stolen a treasure of one of the other clans: the headdress/crown of Queen Sidisi of Sultai clan. Maybe he has the headdress slung under his arm, looking at the viewer as if to say, "You want it back? Come and take it. Mood: Humorous, but should be illustrated realistically (not cartoonish). This guy is a real thorn in the side of the other clans. 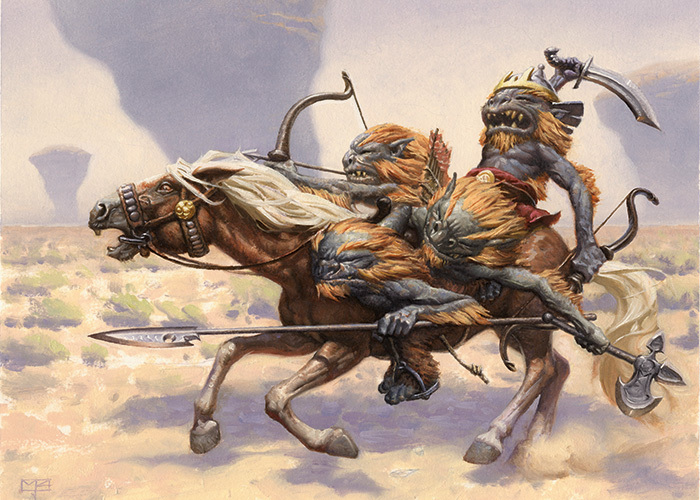 Action: This is a group of four Mardu Clan goblins who are all riding a horse. What we mean is, they're all riding the SAME horse. One of the goblins is clearly the leader—maybe he wears an oversized helmet, facing forward. The other three goblins are hanging on however they can, dangling from a stirrup, climbing up the reins, etc. Mood: This is a funny scene, but it'll work best if you play it straight (illustrate them realistically). These gobbos believe they're fierce, proud warriors of the Mardu Horde.